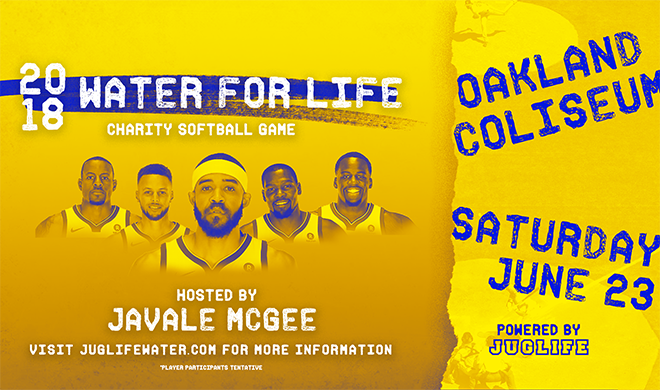 Golden State Warriors center JaVale McGee will host the 4th Annual Juglife Foundation Water For Life Charity Softball Game at the Oakland-Alameda County Coliseum on Saturday, June 23rd. 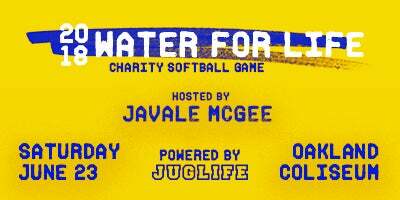 The event will benefit JaVale’s Juglife Foundation, which promotes a healthy and active lifestyle by encouraging everyone to drink more water. The star-studded event will feature local and national celebrities, musical performers, TV & movie stars and athletes from all sports. Last years attendees included: Kevin Durant, Miles Teller, Marshawn Lynch, Andre Iguodala, Blake Anderson, Amber Rose, Draymond Green, Matt Barnes, Sean Smith, TJ Ward, Ian Clark, Patrick McCaw, Ros Gold Onwude, David Amerson, Mistah Fab, Lorenzo Neal, Taiwan Jones and more! The JUGLIFE Foundation was Co-Founded by NBA player JaVale McGee, and Kez Reed. Our mission is to help everyone understand how critical water is to life and a active lifestyle. There is a water crisis happening around the world with over 780 million people lacking access to clean and safe water, resulting in millions of water-related illnesses and deaths. There is a health crisis happening in the United States with America’s obesity rates reaching record levels. The Juglife Foundation addresses both crises by providing clean, safe drinking water in underdeveloped areas of the world, and promoting water as the best choice for an active healthy lifestyle. Doors Stadium doors open at 1 pm. Parking will cost $25 for cars and $50 for buses.